Igs is file format that allows digital exchange of information between CAD systems. With Igs, CAD user can exchange product data models in the form of wireframe, circuit diagrams, freeform surface and solid modeling representation. Igs or Iges means Initial Graphics Exchange Specification, and is published in January 1980 by National Bureau of Standards. Iges file is divided in 5 sections: Start (S), Global (G), Directory Entry (D), Parameter Data (P) and Terminate (T). Iges standard was first ANSI standard to be documented by itself. Since version 4 all of the technical illustrations for the printed version of the standard have been generated from Iges files. How to open an Igs file? IGS Viewer is a tool for viewing international IGES standard files. IGES files (.igs, .iges file format) for 3D and assembly are often used by all major mechanical CAD systems. With this absolutely FREE IGS Viewer you can easily open 3D files (*.igs), rotate them and perform some basic actions like: zoom, rotate, move or change skin and skin color. 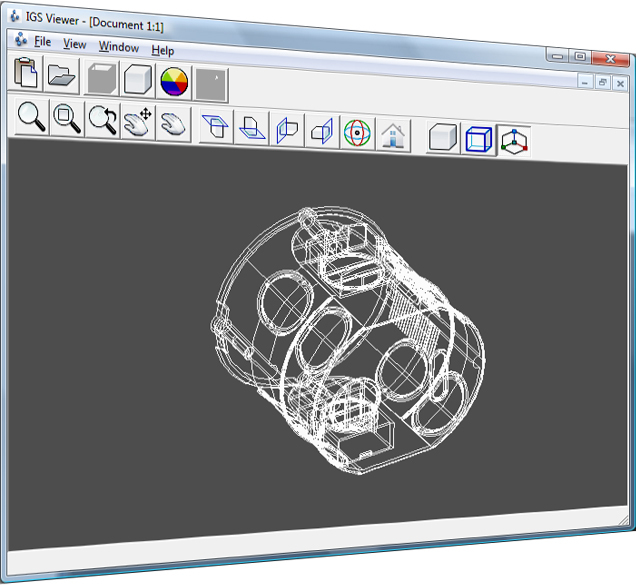 Download IGS file viewer and start viewing the world in 3D. Please refer to the Walk Thru section for more information's and screenshots.